The SR series solar insolation relay controller with the accompanying sensor panel is a great way to automatically turn on or off devices with sunlight. 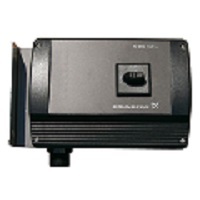 This insolation relay is designed to allow switching of small loads at userselectable predetermined sunlight intensity. 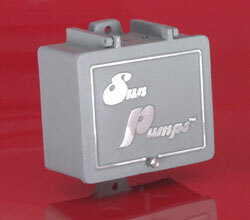 SunPumps SP-SSR controller is a relay switch and a sun insolation meter. Sun insolation is the amount of the sun's radiation at a specific point in time. It can be thought of as the intensity of sunlight. With this meter, the intensity of the sun is measured in percentage of full sunlight with 100% being 1000 W/m2. (Watts per square meter) When properly installed and configured, the unique features incorporated into this unit will automatically activate a relay based on a pre-selected percentage of sunlight. 1. Easy to read LED array. 3. Configurable activation set point between 15% and 50% in 5% increments. 5. SPDT relay with NC, NO, and COM connections available. 6. Rising clamp screw terminal blocks - no fork terminals required. 7. Weather resistant enclosure with a hinged door.